"In the family home a sewing machine is set up and a Shabbat table - to show that during the week we work and on Shabbat we rest." The houses in the shtetl have been deliberately built crooked, the narrow streets in between them are cobbled, and the ceiling has been painted to look like sky by local painter Judith Levin. She is the project's resident artist and also created the detailed stained-glass windows of the shtetl synagogue. In each house, a video, shot by award-winning local filmmaker Simon Marcus and featuring costumed child actors, explains the meaning of the items in the house. Some of the furniture was donated by members of the community, and the authentic metal lanterns which light the homes were donated after Mrs Angyalfi spotted them at a Chabad convention in New York. Mrs Bell has come up with many innovative ways to teach visitors about halachah (Jewish law). In the shtetl stable, children can stamp animal hooves into sand to see if the hooves are cloven and establish whether or not the animal is kosher. As visitors emerge from the shtetl, they enter a modern kosher play-kitchen and a mini-supermarket. Mrs Bell said: "We want to show that we still follow the traditions and laws of the shetl, but we do it in a modern way." 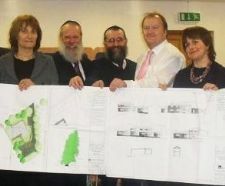 It will open as an extension to the existing Chabad Centre on Shadwell Lane, Moortown, and will include a café and soft play area. Cookery workshops, lectures, and arts and crafts will also be run in the centre. Although the centre will not be open every day to the general public, Mrs Angyalfi said there was a huge demand for school visits and interest from adult groups, including the Women's Institute and the Gypsy and Traveller Association. Mrs Angyalfi added: "The Jewish community in Leeds has been very supportive of the project - the Leeds Representative Council has held a meeting here already. We really want it to be something they are proud of." A groundbreaking ceremony was held at the Leeds Chabad Centre marking the beginning of construction of a Jewish Heritage Centre for Children funded by the Heritage Lottery Fund.